TRIVIA of Noh : Q122 : Which kyōgen piece is based on a French conte? | Home | Trivia | Q122 : Which kyōgen piece is based on a French conte? Which kyōgen piece is based on a French conte? The new kyōgen piece "Susugi-gawa" was created in the Shōwa era from a French conte, or fable. 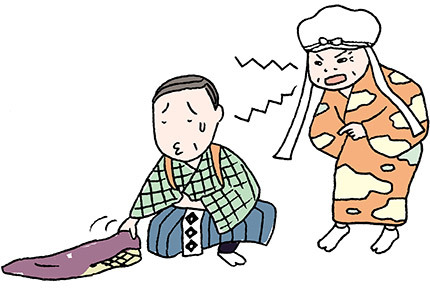 It is often played by the Shigeyama family of the Ōkura school. A man who does washing in the river behind his house is fed up with his wife and mother-in-law, who often tell him to do jobs many times. He gets them to agree to write out all of the jobs and also that he will not do any jobs that are not on the list. In the middle of the play, a cloth falls in the river. The wife tries to pick it out but falls in the water and is drowning. She calls for help, but the man takes his time, asking her whether the request is on the list. He finally helps his wife, while making her promise not to order him about any more. In the end, he is criticized for not helping her sooner and is no better off than before. The play is considered a typical piece in the henpecked husband genre. Written originally for theatre by Iizawa Tadasu, the play is based on the 16th century French conte "Le Cuvier" (The Washtub). It was arranged for kyōgen by the Shigeyama family and become part of their repertory. Directed by Takechi Tetsuji, who worked to revive classical performing arts after the Second World War, it was premiered in 1953 (Showa 28). The dropping of the cloth in the river can be portrayed as accidental or intentional, depending on the stage direction.